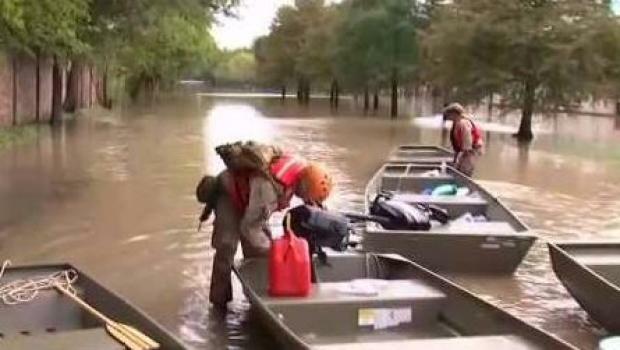 Meteorologist Chris Gloninger reports from Harris County, Texas, where many rescue operations are still underway for the people stranded by flooding left behind by Hurricane Harvey. 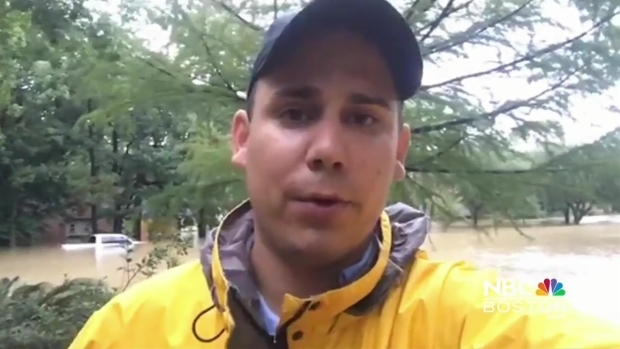 NBC Boston meteorologist Chris Gloninger is reporting live from Texas as the state braces for additional flooding after being battered by Hurricane Harvey over the weekend. Gloninger and NBC Boston photographer Cary Patton flew into Dallas on Sunday night and then made their way to the Houston area. In many areas of Houston's suburbs, flood waters are up to the top of area homes. Street signs and lamps are also completely submerged. On Thursday, Gloninger reported from Harris County Thursday, where he prepared to go out with first responders as they continue their rescue efforts. The Katy fire chief said crews have been dealing with high water and stranded people since Saturday. By Wednesday night, Gloninger and Patton met up with John and Jenni Etgen who were paddling back from their house in the Brairforest neighborhood in Houston. "Oh, this is at least 7 feet above any previous water that ever came in here," said John Etgen. The couple said they left their house very early on Saturday. "We had to leave at 2 o'clock in the morning on a minutes notice. We had the shirts on our backs the two cats and our daughter and that's it," said John Etgen. John and his daughter paddled back to the house Tuesday where they took pictures of the damage – massive flooding and muddy water up to the counter tops. They went back to take the pictures so that Jenni could see the devastation. "We just saw the outside. It was devastating. The water was above my head," said Jenni Etgen. Even after the last drops of rain fell, water levels are going up – thanks to a reservoir upstream. "They are sending huge unprecedented amounts of water down right now. I understand why. It's to protect the integrity of the dam," said John Etgen. On Wednesday morning Gloninger returned to Houston, where he reported from a gas station, showing the common sights after the flooding. He showed the front of a gas pump ripped off by the waters. He also pointed out an abandoned car, something he said was happening often because of the lack of gas and the difficulty traveling by vehicle. The clean up continues in Texas as Harvey makes its way east. In the afternoon, Gloninger met with volunteers who were out helping storm victims. Christina Cave, a volunteer coordinator, was running the PNG Center, where Stephen Johnson answered a call to help. Johnson and his wife were one of hundreds who stood in line Wednesday morning to lend a helping hand. Despite the storm making landfall Friday night, rescues were still happening Wednesday morning. 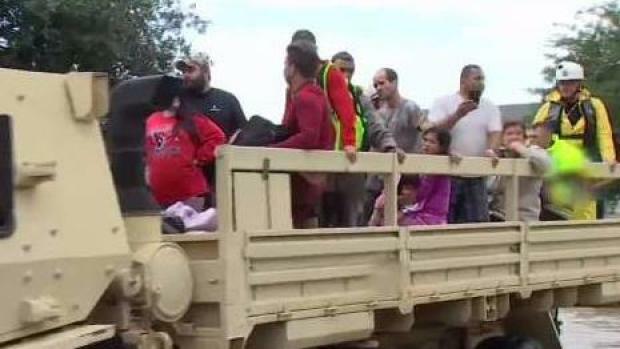 Gloninger and Patton captured footage of a group of people, including two children, being rescued in the early hours of Wednesday. 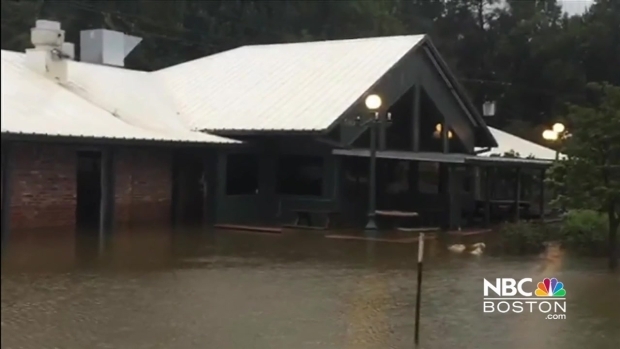 As evacuations continue in parts of Texas, NBC Boston Meteorologist Chris Gloninger and photographer Cary Patton, continue to follow the stories of residents who are impacted by the devastating floods. On Tuesday night Gloninger and Patton took a break from their exhausting day and ate dinner with two strangers, Jessica Buckley and Stephanie Khamou. The women were at the last table served for the night and their were two spots left. Khamou, who lives in Katy, had to evacuate Monday with her family. "We were there before, nothing was there, we came back about an hour and a half later and it was up to our ankles" said Khamou. "Now it's just completely underwater." Buckley, Khamou's friend, said her family's home was not touched but the devastation is still hard for her. "It's honestly heartbreaking," she said. "It's a moment where you can't turn off the news but it just breaks your heart watching it the whole time." He reported live from Rayford Tuesday morning, where he said the flooding has gotten worse, bringing more road closures. Gloninger said, "The rain continued to fall heavily through the overnight. As rainfall increased, so did the road closures. After the 11 p.m. newscast we went back to our hotel in the Woodlands. We were on the road six hours later and most roads surrounding the hotel we're closed." He added, "It's been a challenge finding roads that are open. Since this is a natural disaster there is no time to post detours. You can drive 20 minutes down the road and then find out it's closed. From spring we have made it to Conroe Texas. It's our plan to travel an hour west, a half hour south and then another hour east. This should (I hope) allow us to access some of the communities hard hit west of Houston." In Cullen Park Tuesday, Gloninger spoke with multiple people, who all needed to flee to higher ground. Most had to leave behind everything. Meteorologist Chris Gloninger is live in Texas reporting on the devastation in the state from Tropical Storm Harvey. Many good Samaritans were trying to get to the hardest hit areas to help on Monday night, but were stranded in Spring, Texas. "It was stopped, as far as I could tell," one man helping to rescue people told Gloninger. "I've been unable to get to places that we need to get to." One of those calls was at the Fairfield Inn, where 60 guests needed to be rescued. "I was just visiting with the sheriff and it's not a manadatory evacuation now but it's those guests that want to leave, can leave," said another man helping in the relief effort. "If they want to, they can stay. It's not manadatory." Gloninger, a former firefighter, was on the scene and helped direct rescuers to a man who was trapped atop his car after driving into the flood waters in Spring early Monday morning. He and his photographer were driving down the road when they noticed a man on the roof of his car and yelled to him to see if he needed help. The man had become trapped and was afraid to swim away because of the strong current running past his car. Another Good Samaritan wearing waders came along and helped the man swim to the curb. "Once you make the mistake of thinking the barricades are removed and you go in, you can't even make a U-turn," Ernest Garcia told NBC Boston after being rescued. "You just start floating. It was just a matter of seeing how far I floated off." Gloninger also alerted a local sheriff's deputy to a family of five that he had encountered that was in need of rescue. He's also seen several other cars get stuck in the high water, and observed several people being rescued from area homes. He said sheriffs are warning people to beware of water moccasins, gators and fire ants in the water. Meteorologist Chris Gloninger has the latest on the flooding conditions in Texas from Tropical Storm Harvey. They came across one man driving down flooded streets in a boat Monday, attempting to help residents who became trapped by the rising water. "It's a weird feeling," Cristian Parau said. "I should be here in a car, right?" Parau said he's never seen anything like this in his years in Texas. "You can't mess with Mother Nature, you know?" he said.